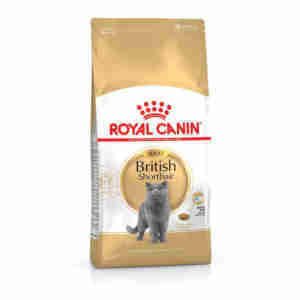 Royal Canin British Shorthair has been developed to support the specific needs of your adult British shorthair cat. This food has been specially formulated to give your British shorthair the optimum nutrition for their specific needs. To keep your cat looking his or her best, it contains the right combination of nutrients needed to maintain muscle and support healthy bones and joints. Taurine and fatty acids EPA and DHA are used to enrich the food, and are essential for a healthy heart. Nutrients in the food also support your cat's urinary system, helping prevent against issues such as urinary stones and urinary tract infections. The specially designed large kibble makes it easier for your British shorthair to pick up their food and encourages them to chew properly. This aids digestion and will help to keep your cat feeling full after eating. The kibble's unique shape also supports your cat's oral hygiene, discouraging the growth of plaque. exclusive kibble helps your British shorthair chew their food and maintains dental health. As a breed with distinct features and characteristics, your British shorthair cat has subtly different dietary needs to other cats. One of your cat's most distinguishing features is their round face and large jaw, which can make it a challenge for him or her to pick up and chew small pieces of food. This means that a larger than average kibble will help your cat both enjoy their food more and eat it more easily. Although British shorthairs are generally a very healthy breed, they do have a higher risk of HCM (a form of heart disease) than some breeds. For this reason, a diet which provides the nutrients to support a healthy heart is a good idea, and will give you peace of mind knowing that you're doing all you can to safeguard your pet against potential issues. Dry Ingredients: Dehydratedpoultry protein, vegetable protein isolate*, rice, maize,animal fats, maizegluten, vegetable fibres, hydrolysed animal proteins, chicory pulp,minerals,soya oil, fish oil, fructo-oligo-saccharides, hydrolysed yeast (source of mannooligo-saccharides),borage oil, hydrolysed crustaceans (source of glucosamine),marigold extract(source of lutein), hydrolysed cartilage(source of chondroitin). ADDITIVES (perkg): Nutritional additives: Vitamin A: 29300 IU, Vitamin D3: 800 IU,E1 (Iron):40 mg, E2(Iodine): 4 mg, E4 (Copper): 6 mg, E5 (Manganese): 51 mg,E6 (Zinc):154 mg, E8 (Selenium): 0.08 mg, L-carnitine: 200 mg, Taurine: 3 g -Preservatives -Antioxidants. ANALYTICAL CONSTITUENTS: Protein: 34% - Fatcontent: 19% - Crude ash: 6.8% - Crude fibres: 5.3% - EPA & DHA: 3.5 g/kg.*L.I.P. : protein selected for its very high assimilation. Wet Ingredients: Meat and animal derivatives, cereals, fish and fish derivatives, vegetable protein extracts, minerals, derivatives of vegetable origin, oils and fats, various sugars. ADDITIVES (per kg) :Nutritional additives: Vitamin D3: 265 IU, E1 (Iron): 8 mg, E2 (Iodine): 0.09 mg, E4 (Copper): 0.7 mg, E5 (Manganese): 2.4 mg, E6 (Zinc): 24 mg.
great food for British Shorthair cats, but supplier slow to despatch order. The price is right and my cat thrives on it.